MUDA: The name didn't ring a bell, nor could I easily make out the acronym. But after posting a snapshot of this tile graffiti--spotted on Lafayette Street in Manhattan when in town for last week's Creative Time Summit--on Facebook, I quickly learned more. 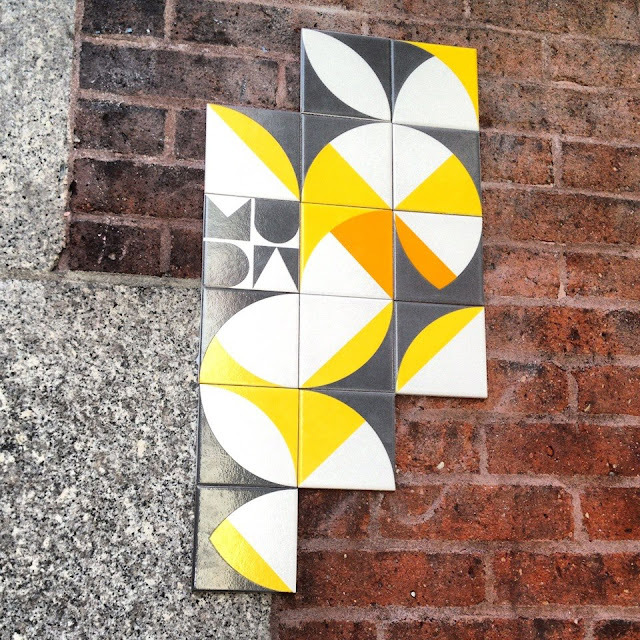 MUDA is a two-year-old Brazilian art collective, and one of its members is in New York until October 18 doing more guerrilla tile installations--including one yesterday at 5 Pointz in Long Island City and one today in a subway station. João Doria, a Brazilian graphic designer who spent a month at the Walker Art Center this spring, commented on my Facebook photo that the piece was by MUDA, then MUDA co-founder João Lobato Tolentino commented, letting me know he and his wife did the piece. MUDA, Tolentino says via email, is a Rio-based collective he started with architect Duke Capellão, a friend of 15 years who now rents studio space in the same building. A designer, he writes, "I've always liked patterns, so I was in a personal quest for patterns when one day Duke came to my office and we started to think about new possibilities for using them. We ended up designing a pattern [intended to be reproduced on] a floor tile, and we just loved it. We went crazy thinking that doing something like that in the streets as street art would be something new that we haven't seen before." In developing the form, MUDA--which he says is an "an imperative way to say change"--expanded to include his wife, Bruna Vieira (also a designer in his studio), and Diego Uribbe and Rodrigo Kalache, both partners in Capellão's architecture firm. They searched out a specific type of tile which is very affordable in Brazil. With the idea, "we though we were blessed, because our work won a huge power that comes from Brazil's colonial past and all the Portuguese culture that is so strong there." "I'm gonna put it on a substation. I've already found the spot, and I go there every day in different hours to see how the station is, and to decide when is the best time to do it. This final one is also going to be the bigger one! It's a game of thrill, and once you taste it, just can't stop... We'll be doing this last piece tomorrow or the day after that, and Thursday we'll be leaving back to Rio de Janeiro, hopefully full of stories and satisfied with our MUDAs overseas." 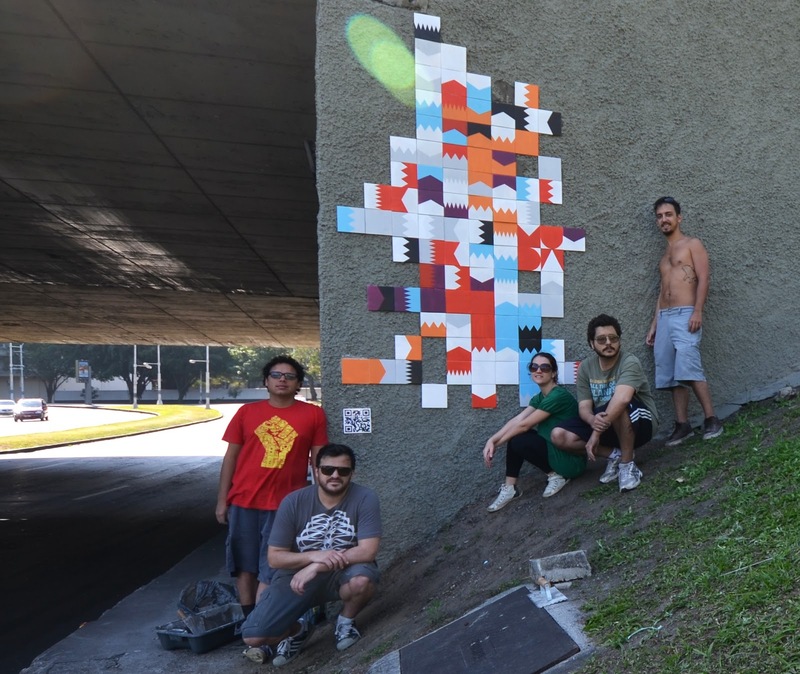 For more on MUDA, read Nathan Walters' piece from The Rio Times.